I am going to show you how you can create your own website based on WordPress, a static website which you can manage online and which looks like a standard website. The first thing you need, once you get the idea for your site, is a good domain (aff) name and get that registered. Is it easy to type in your browser address bar without obvious typos? Does your site name contain Trademark words, or could you get into other legal problems with that name? Is it catchy or brand-able? I can highly recommend them as a domain registrar, but you should also check the box for Auto-Renewal to make sure you won’t loose it because you missed a notification. Now you need somewhere to place your website so it is reachable by everyone on The Internet. Sounds expensive? With a Shared hosting (aff) account, you won’t break the bank. These hosting accounts are around 5 to 7 dollar. I recommend getting a reliable and secure hosting account from either from Hostgator.com or Siteground.com. Both hosting companies use the secure suPHP option on their servers, keeping your WordPress website as secure as possible. Got your hosting package ready? The go back to Namecheap.com, log in and point your domain DNS servers to the servers your hosting company assigned to your account. The biggest benefit of this setup (domain-name and hosting separately) is that you can change hosting providers very easily if needed. You could also create a backup site at a different provider and change over directly if any problems occur on your main site. There are basically two way’s to install WordPress, manually or with a hosting provided script that will do the most parts for you. Go to the WordPress.org site and get the latest version of the Free WordPress Software. 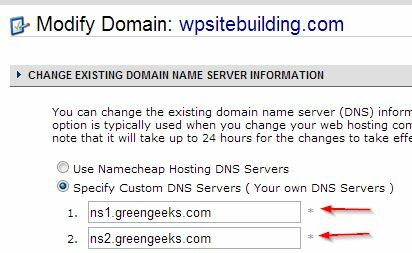 Go to your domain name URL (or subfolder) and start the installation, you will be asked for the information at step 1. Log in to your new WordPress based website and start the configuration. With the last installation option, you are running the site within 5 minutes or less. Once you have installed WordPress on your website, I will show you what settings you need to configure, including some special things. You can reach and change these options via your “Dashboard” menu on the left side on your screen. The first thing you need to do is to check the Settings -> General and change the Tag Line from “Just Another WordPress Weblog” to something that is fitting for your website. Now you can also change the time zone if needed. Change your user profile, especially your screen display name so you won’t show your login username. Go to Users -> Your Profile -> Type in your Name and Nickname and then select your choice in the drop-down box below. Set the Permalinks option (Settings -> Permalinks) to Post name, which will change your post and page URLs from /?=755 to something like /which-widgets-to-use-in-your-sidebar. Which is much more user and search engine friendly. Delete or change the sample About page -> Page -> All Pages -> Edit or Delete. Check if you can upload an image -> Media -> Add new -> Select a file from your harddisk and see if it works, then you now the rights for that folder are ok, and you can upload images and insert them into posts and pages. Replace / remove the default sidebar widgets like the meta box. Go to Appearance -> Widgets -> Open Primary Sidebar on the right and drag the Widget Recent Posts and Categories into it. If you have any others you don’t need, delete them from that sidebar for now. Change the Uncategorized category name to you main website topic Posts -> Categories -> Uncategorized -> Edit -> type in your main website topic name and clear out the text uncategorized in the slug field! Save it and WordPress will create the new slug itself based on the first field. Check out your site at the Frontend to see everything is working. WordPress layouts and site presentations are done with themes, which make it very easy to change the way your website looks. There are several designs available at the theme’s site of WordPress.org, all of which are free to download and use. There are some websites out there that sell great themes. I suggest you check the template code to get an understanding of how they work. If you buy a commercial theme, you will get access to tutorials that show you how to get the most out of your purchase. For a true static website impressing, rather than a blog you will need to change some items in the theme. It is important to understand that ANY theme can be used to create a Static WordPress website, but there is a difference between building a site this way and using a WordPress Magazine Style Theme*. Using a theme such as the WordPress Magazine Style Theme is not the same because you use posts to fill your site with post’s content instead of pages. I will give you tips on how to work with both types of themes further on in the site. You can also create your own WordPress menus for easy navigation and links into your website. WordPress Plugins are extensions for the WordPress software that can assist to overcome some limitations of the blogging software by helping extend its possibilities. Of course, there are some plugins needed to optimize your website for search engines. You will find the best WordPress plugins to get your site up and running in no time, as well as get you indexed in search engines. Setting up a website with a content management system could cost you thousands of dollars. However, you are already looking into one of the better and cheaper options, WordPress! The most valuable asset of all is your time, but I cannot start to image how much that will be! Also optional is a special designed WordPress theme, which will cost you at least several hundred dollars. So if you just go for the basics, your total cost per year will be around 75 dollars for your first domain. Start to Building a WordPress Website Now! Overall, you want a website that is easy to set up and to maintain and doesn’t cost too much, right? So let’s get started! Today is a good day to build a website with WordPress and see how far you can get creating your own place on the Internet.